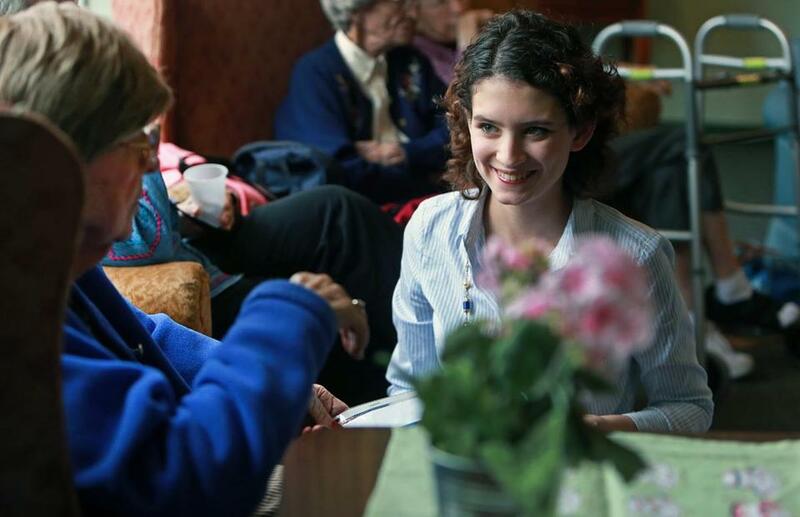 Marina Renton,18, works with Harriet Longley in a storytelling program at the assisted living facility where she volunteers. ANDOVER — Marianne Flynn looked closely at a picture of two penguins touching wings as she sat in a circle of chairs with six other residents on the fourth floor at Atria Marland Place in Andover. “Where do you think this picture was taken?” Marina Renton gently asked from her spot on the rug. “I’d say the West Coast, because I come from the East Coast, and I don’t see too many of these,” said Flynn with a smile. “What might their relationship be?” she asked as she took notes. Every Friday afternoon, Renton, 18, visits Atria Marland Place to work with the residents on the secure top floor, for those with dementia. Using a creative storytelling program called TimeSlips, Renton relies on picture prompts to get memory-challenged residents to share their ideas. With these photos, including the one of the penguins and a shot of an older woman jumping unusually high on the beach, residents who would ordinarily feel the pressure of remembering are encouraged to generate new ideas, each thought validated and recorded to create a story. Marina Renton, with Atria resident Marianne Flynn, won $500 in the Alzheimer’s Foundation of America’s Teens for Alzheimer’s Awareness scholarship competition. What started as an after-school activity has flourished into a transformation in the residents, which inspired an essay that recently earned Renton a $500 scholarship from the Alzheimer’s Foundation of America. Renton, a graduate of Andover High School who will attend Brown University in the fall, said she’s happy to share her love of storytelling. 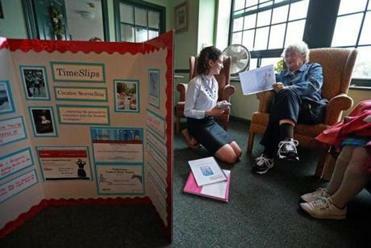 “It’s been something that’s been therapeutic for me, so when I heard about the TimeSlips program, it sounded like it could be really beneficial,” she said. Renton started volunteering at Atria Marland Place in February 2012 after a community service requirement led her back to the facility where her grandfather resided during the last six months of his life. As a way to thank the staff for the compassionate care he received, she volunteered by handing out snacks, painting nails, and interacting with the residents. However, Mazza quickly sensed that Renton could be put to better use. Mazza said that unlike many other teen volunteers who put in their required hours and move on, Renton brought innovation to the facility. Soon after she was reassigned to the fourth floor, she learned about TimeSlips on the radio, took the four-hour training, and became a certified facilitator. According to a 2009 study by the Gerontological Society of America , seniors who participate in a TimeSlips program are more engaged and alert. “A lot of literature suggests that this short-term stuff is what matters to people with dementia because that’s really what you’re living in, you’re living in the moment,” said Renton. Her mother, Anita Renton, expressed pride in her daughter for enabling the residents to feel the validation of sharing their ideas. She mentioned a time when one resident saw a picture of a woman dancing and expressed shock at the height of her skirt. “You get to see the humor, you get to see the moral sophistication, you get to see the personality that you don’t always see otherwise,” she said. When Renton leaves Andover and heads to Brown to study business and modern culture and media, she will be missed at Atria Marland Place. But she’s already found someone interested in taking over her shifts so the program can go on. For Renton, continuing TimeSlips makes an important difference in the lives of the memory-challenged residents. Christina Jedra can be reached at christina.jedra@gmail.com.